A live-action blog to go with the book, The Fortune Cookie Chronicles, published in March 3, 2008, on how Chinese food is all-American. There are more Chinese restaurants in America than McDonalds, Burger Kings, and Wendys combined. The Fortune Cookie Chronicles is for anyone who has ever wondered who is General Tso and why are we eating his chicken; why Jews eat Chinese food on Christmas; and who really invented the fortune cookie. New York Times reporter, Jennifer 8. Lee, solves enduring mysteries of Chinese cuisine through a mix of in-depth research and entertaining personal anecdotes. and featured on Colbert Report, Martha Stewart, TED.com, CNN, The Today Show, Good Morning America, Newsweek, Entertainment Weekly, and NPR stations coast to coast. Plus Borders Original Voices and Book Sense selections. Follow me on Twitter! Fan me on Facebook. There are more Chinese restaurants in this country than McDonalds, Burger King and Kentucky Fried Chicken combined. In The Fortune Cookie Chronicles, author Jennifer 8. 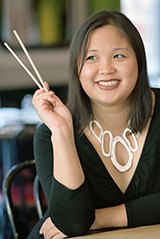 Lee takes readers on a remarkable journey that is both foreign and familiar: penetrating this subculture by traveling the world (and almost every American state) in her quest to understand Chinese food and the people who make it. Her journey took her to the hometown of General Tso (a military hero immortalized as much for crunchy chicken as his conquests), the surprising origins of the fortune cookie (it’s not China), and to six continents in search for the world’s greatest Chinese restaurant. The book also sparks debates as to who really invented chop suey and why Jews love Chinese food, or as she puts it: Why is chow mein the chosen food of the chosen people? The book is a tribute to immigrants and to America. If our benchmark for Americanness is apple pie, ask yourself, how often do you eat apple pie? Now how often do you eat Chinese food?